This Mid Century home is approximately 2100 square feet with lovely furnishings. Renovated baths, kitchen, patio and separate mahogany wood pool deck and lush landscaping. The private and exterior surroundings enhance the wonderful interior living spaces. Floor to ceiling living room windows and sliding glass door bring the feeling of outside living, inside. The floor plan is conducive to enjoying the patio and pool family entertaining area, as well as watching the 65" smart TV, listening to music or simply enjoying the view from above. There are 4 BDRMs: 1Q, 2 Twin bdrms (2 twins beds each), and 1K. As owners of this seasonal rental for over 25 years. The house is maintained and enhanced with upgrades regularly. We insure the house is in the best shape for your arrival. We monitor the cleaning process and inspect the property prior to your arrival to make sure all is order to make your stay an enjoyable one. The location is great 1/2 mile from Main St. It has a private pack yard and picturesque views from the patio, deck and living room. Biking is easy and the beach is close. Main Street is just a 15 min. walk. The beach is a ridable 2mile bike ride away. You will love the large backyard patio and pool deck. The large pool is surrounded by lush landscaping and natural vegetation which provides an eye catching and private surrounding for your enjoyment. The house has a large living room with plenty of seating to watch the 65" Smart TV, or just curl up with your favorite book. The bedroom and bath layout offer flexibility and functionality adding to your overall comfort. toilet, combination tub/shower, Newly renovated. Wood fire place in living room which has it's own cozy area for sitting. It is adjacent to the main living area. One full set of bath towels are provided per person. Please bring your own beach towels. There are extra towels if needed. 20 x 40 living room. Floor to ceiling windows overlook pool and back yard. Fireplace. 65" Smart TV. Included are start up staples. e.g.paper goods cleaning supplies, and spices. Fully equipped, service for 12. Granite countertops. Kitchen has direct access to the patio and pool/backyard area. It is fully equipped. Large oval table will seat up to 8 people. DVD available in living room and kitchen. Board games for all age ranges. Mahogany deck surrounds 18' x 36' pool. with large paver patio off the kitchen area. Easy access from drive way through backyard slider. Mini private suite with private bath all on same floor. Access to kitchen and backyard. Heated pool. Newly landscaped back yard. The house is a fantastic getaway suitable for adults and families. Sunny and private pool area. Lush landscape and naturally wooded private back yard with room to play. We spent the month of July in this charming home. 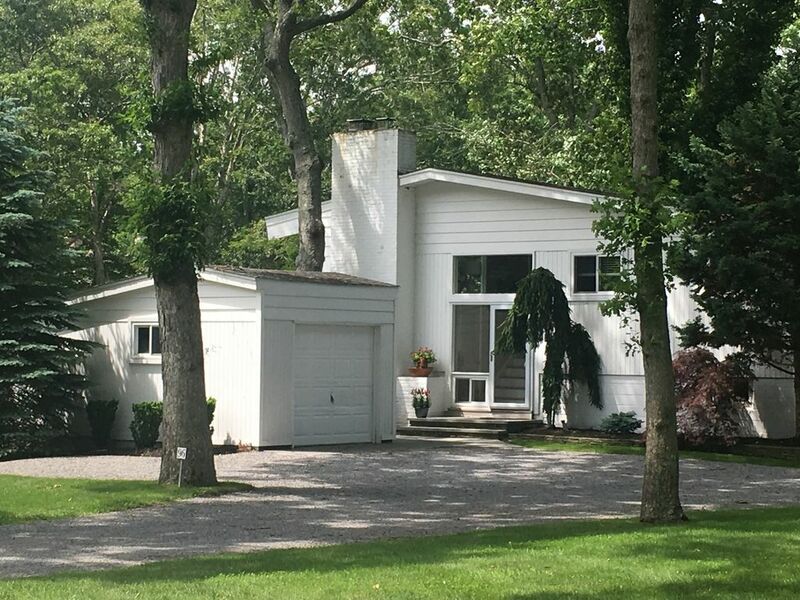 The location is great as it is within walking/biking distance to Main Street Westhampton Beach and while it is on one of the main thoroughfares into town it is in a quiet residential neighborhood. The layout of the home is great as it provides privacy with a separate master bedroom and bath in one area with 3 other bedrooms and bath in another area of the home. The living room has floor to ceiling windows which overlook the lush backyard and pool. We saw deer nearly every night just outside the fenced in yard. The pool area always has a breeze and the heated pool is set at just the right temp. The owner is most gracious and responsive to questions and any issues which may arise. I would recommend this home to anyone looking for a comfortable base from which to explore all that the Hamptons have to offer. We spent last week at this home and I cannot say enough good things about our experience! The house was stocked and well organized- such a treat after a long day packing and driving out not to immediately have to run out for basics that you may have forgotten like coffee, toilet paper or a phone charger! I really appreciated that as well as the packet of local information and welcome bottle of wine! The house is immaculate and the layout really worked for our family. We spent a lot of time in the heated pool, and often took an easy stroll into town for dinner. Diane and John are top notch landlords and I am already looking at my schedule for next year to rent it again! The house is in a great location and pool was a plus! House was equipped with everything that we needed. Thanks Diane! This place was amazing. It was close to everything and we had all the conveniences of home. Diane was so helpful and made us feel completely welcome with her warm greeting. The home is extremely clean and can easily accommodate a large group. You will not be disappointed. We had such a wonderful experience while we were there, Diane was so accommodating and easy to get ahold of. She has a lovely home and it was exactly what we needed, it is in a great location and everything we could have hoped for. Thank you so much Diane for making it such an enjoyable stay. Thank you so much for selecting our home for your stay. I am so please you enjoyed the house and the area of Westhampton. You took such wonderful care of the home which is greatly appreciated. Enjoy your summer and hope to see you again in the future! This house was the perfect mid-century beach house for my vacation. Open and airy, one side of the house had a LARGE window (you felt like you were outside; but the surrounding trees and landscaping made it feel private, so you didn't feel to exposed), it was so pretty. Beautifully decorated and comfortable, updated kitchen, bathrooms, bedrooms (all rooms current), and a private heated-pool area with a new BBQ. (so many of the homes I had looked at previously, either were not updated at all OR had only 1 maybe 2 rooms updated and the others were still back in the 70s/80s...yuk!) Also, in a great location, took an hour and a half to drive there from the city, and once I got there I could walk to town. (Great little Main St) Beaches were close and there were many great local restaurants nearby. The accommodations were great...highly recommend. I will be back next summer for sure. The Village offers outdoor Concerts On the Green, art fairs, live theatre, movie theatre, shopping, dining, 4th of July fireworks. Kayaking, boat tours and other "like" rentals. Plus the library holds events for adults and children. Never a moment with out something to do or... just do nothing! Holiday weeks and weekend prices are higher than midweek stays. Please write or call for rates if you are interested in MD-LD, Monthly or 2 week stays. Our Weeks usually run Sunday to Sunday. Pool Heater Propane: we offer 10% of the tank Free for weekly guests. Payment for additional propane is the responsibility of the guest. Pets are considered.